STAIR ROPES. COM (UK) make stair ropes, bannister rope, rope handrails and barrier ropes to measure. We offer a bespoke service using traditional rope working and knotting techniques, and a specialist knowledge of ropes and cordage. StairRopes.com supply high grade ropes, exclusively designed stair rope handrail fittings and skilfully tied end knots to suit your style. We provide a comprehensive guide to measuring for a rope bannister, which includes an example pricing. For more information or advice about staircase ropes and hand rails take a look through our detailed f.a.q.s page or contact us direct. 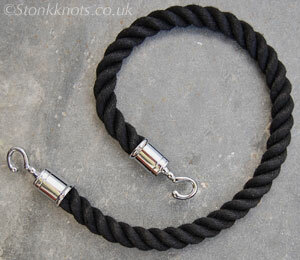 Order your stair rope securely using a credit or debit card or by bank transfer. Our stair ropes or bannister ropes arrive complete and ready to install with end knots neatly finished and fittings in place - wall screws and rawl plugs are included. 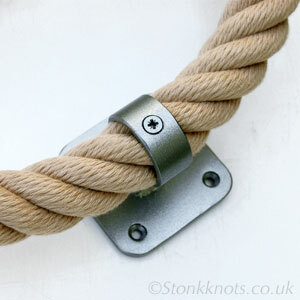 We also supply made-to-measure barrier ropes. A ROPE BANNISTER OR HAND RAIL that uses a well-made rope and is properly knotted, provides a strong handhold, makes an original feature on any staircase, hallway or corridor, and presents a solution for many stairways where conventional banisters are not appropriate. 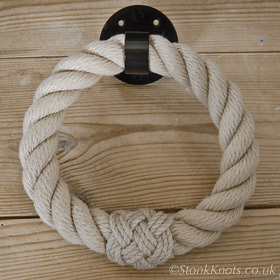 Stair ropes and barrier ropes are individually made to measure by James Watson, experienced craftsman and co-founder of Stairropes.com and Stonk Knots. The two sites form part an established family run business, originally from Cornwall, U.K. and trading since 1994. See what many satisfied customers have to say about us below. More testimonials and images of our stair ropes and handrails in situ can be found on the StairRopes.com customers page. Our handrails, banister ropes, barrier handholds, interior rope designs and decorative knotwork have been shipped world wide. We supply directly and can liase at all stages of the project with the customer or via an agent, such as a fitter, architect or designer. Please feel free to contact us if you have any questions about bannister ropes or handrails, need help with measuring for a stair rope or wish to discuss your particular stair case or barrier rope requirements. For some online answers, visit the Stair ropes f.a.q. page, or to find links within the site, take a look through our site map. NATURAL FIBRE STAIR ROPES look great, feel good and complement both classic and contemporary interior settings. A hand rail made of hemp or cotton rope feels firm and smooth to hold, and is extremely hard wearing - an ideal choice for a natural bannister rope. The natural hemp and cotton ropes we use to make our stair ropes are superior quality hard-laid (tightly twisted) 4 strand ropes with a core: more strands even out the bumps on the rope, and the core ensures the rope retains its round profile. A well constructed rope is key to forming a secure and tidy end knot by providing the necessary stability in the strands of the unlaid rope. This is particularly important when working with complex patterns, such as the 3 ply manrope knot. 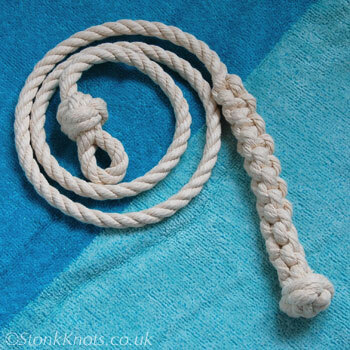 Natural fibre unbleached cotton rope is slightly smoother to the touch than hemp. 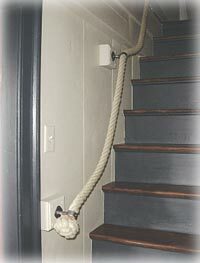 A cotton stair rope needs care to keep clean but can look very smart. The top image shows a coiled cotton stair rope with eyesplices and custom made wrought iron fittings. 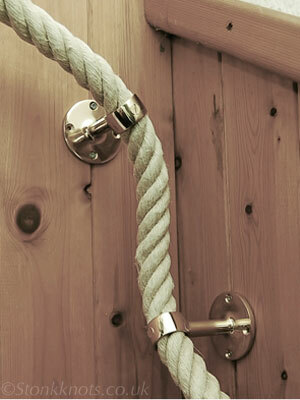 Our hand-made Speciality ropes can be used to create a more decorative effect for handrails and bannister ropes. They feature a combination of natural fibre strands wound (or traditionally - "wormed") around a thicker rope core. These multi strand ropes are available in a choice of materials with diameters of 24mm or 32mm. The image on the left shows a cotton stair rope wound with hemp cord. 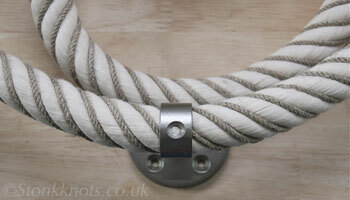 You can see close up images of our natural ropes for stair ropes and rope barriers on the ropes page. SYNTHETIC ROPES are generally more weather resistant than natural ropes, often used for outdoor projects or where a coloured bannister or barrier rope is preferred. The best quality spun polyester fibre (p.o.s.h.) ropes make excellent synthetic imitations of traditional ropes. We offer synthetic p.o.s.h. rope for stair ropes in green, black (examples shown left) and beige (image of gunmetal fitting with square base plate on stair rope, below). The colour is similar to that of natural hemp. These are top quality, medium/hard-laid polyester ropes, specially produced for us in a four-strand configuration, which make firmer and more comfortable handrails than the more common three strand ropes. Extensively used for the rigging on classic and period ships, they are particularly long lasting, being almost totally resistant to rot from moisture (the enemy of natural fibre ropes). An in-built u.v. inhibitor protects against degradation by sunlight (the enemy of synthetic ropes). We can also supply good quality coloured ropes in three strand navy nylon and red polyester. Our range of synthetic ropes includes a hand made specially twisted multi strand rope and may be ordered in various colour combinations. 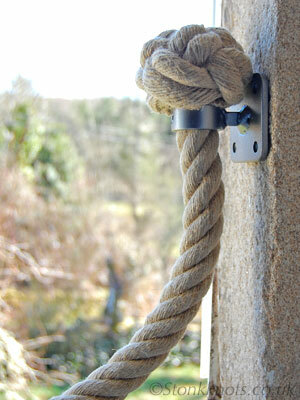 See all our synthetic ropes for stair ropes, rope bannister and handrails on the ropes page. FITTINGS AND BRACKETS have been exclusively manufactured to our own design and specification with the purpose of providing strong supports for our stair ropes and bannister ropes. 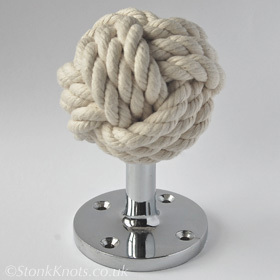 They are available for 24mm and 32mm ropes in English brass, marine-grade stainless steel and wrought iron in a range of designs and finishes. The stair rope brackets we supply are particularly robust, featuring a unique solid one-piece post and a substantial stem thickness. Stairropes.com fittings have a centre retaining screw to secure the rope, and four points of attachment to the wall at the base plate. See the fittings page for more details. We supply English solid brass brackets are polished and unlacquered. Our Marine grade stainless steel fittings are available in brushed satin or polished mirror finish. The stainless steel stair rope brackets are particularly suited to outdoor environments. Heavy duty wrought iron brackets are individually made for us in Cornwall and come in various configurations. Most designs can be adapted to suit. They include finishes in satin black, gun-metal, hammerred steel or bronze with round, square, ornate and rectangular base plates and round or twisted stems. 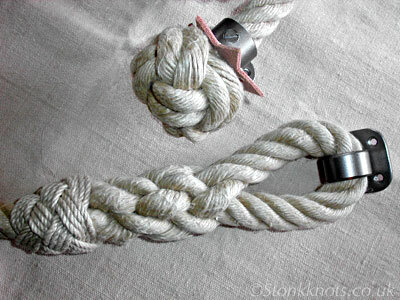 THE MANROPE KNOT is a 'stopper knot' traditionally tied in to the end of a rope hand rail, or manrope on ships. 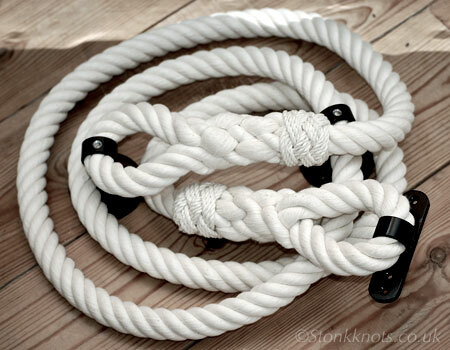 This attractive knot provides a very secure and durable ending for a rope which is to be used for support, such as a stair rope or handrail. 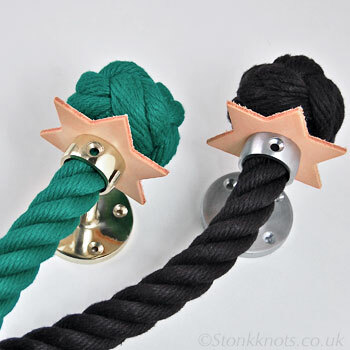 StairRopes.com offer two ply or larger three ply versions of the traditional Manrope Knot, both available for 24mm and 32mm diameter ropes, with optional star washers. An Eye Splice can be tied in to the rope as an alternative and safe ending for a stair rope - especially useful where there is limited space. The eye splice in the image, left, has been worked around a custom made wrought iron fitting with a reduced stem height, and finished with a Turks Head whipping. 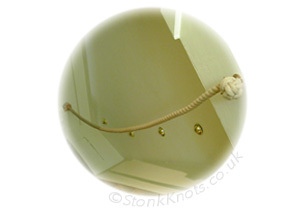 A more decorative option for a bannister rope ending features a crown plait which drops down beyond the fitting. See all the options on our knots page. STAIRROPES.COM also make barrier ropes to measure. Our barrier ropes can be ordered in a choice of natural ropes such as hemp and cotton, high grade synthetic fibre rope (p.o.sh.) in natural shades, black or green, navy nylon or red polyester - with brass or chromed fittings. Barrier Ropes are used to create a temporary or decorative rope barrier - they should not be used for support, or as a substitute for a stair rope. To ensure a safe and long lasting barrier rope, a traditional sailor's palm and needle whipping is sewn in at each end of the rope before attaching the fittings. This provides the strongest method possible for securing barrier rope fittings. For more information, see our Barrier ropes page. A standard barrier rope is made from 24mm natural or synthetic rope, with brass or chromed fittings. Our unique range of hand-made speciality ropes can provide unusual and stylish solutions for decorative rope barrier installations. With a comprehensive range of materials, expert knotting skills and experience in the field of ropes and cordage, StairRopes.com can offer advice on designs for both interior and exterior applications. Often we can find or make up just the right type of rope for a special project, supply a custom made fitting to go on an oddly shaped wall, or advise on and tie a particular knot or splice for a rope ending to suit an unusual situation. Also we can help to put your ideas in to practice - for example, with garden projects, such as decking surrounds, decorative rose ropes and ground borders. Contact us to discuss. Our hand rails and bannister ropes can be seen in interior and exterior settings on our customers page. 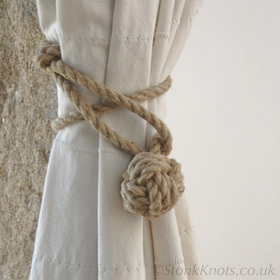 Visit the Stonk Knots site to view some of our other rope projects. That's brilliant. Thanks, James. I really am very grateful for, and impressed by, the excellent service that you have provided. I shall spread the word ! 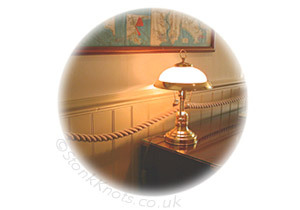 The ropes are absolutely first class, and we are delighted with your workmanship. The stair rope...looks absolutely lovely and we are delighted with it. Many thanks for getting it to us in such good time. Excellent service. I just wanted to drop you a line to say thank you so much for all your help with the Stair Rope that you provided for us. It has been fitted in at the house and our client is thrilled. Thank you again and I hope we can work with you again in the future. Well, I finally got around to installing your outstanding stair rope...the rope works beautifully and is a wonderful addition to the old stairwell and admired by all onlookers. 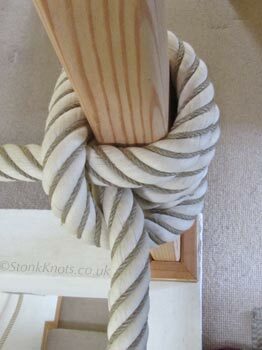 Stair rope arrived a few days ago - looks amazing, we are delighted...Thanks very much! We'll be sure to pass on your contact to anyone who asks! Delighted .. a first class job .. I have taken it outside to the intended stone wall and staircase .. it will be perfect and looks just right. The brackets really look good too .. your man has my thanks also. Received the parcel yesterday, on the wall looks absolutely great. Just sending a note to say thank you for the stair ropes which you provided. James, ...just what we were looking for. Thanks for your prompt attention to this order and we hope we will get the chance to recommend you to others for such a class product. Hi James, I have just received the stair rope, magnificent! Your beautiful rope arrived...Many thanks for all your e-mails and advice. We will certainly recommend you if anyone asks, and there are sure to be some. See the most recent feedback and view images of our stair ropes and barrier ropes in situ here. The anti-spam link should automatically open your email client with a new message addressed to us.